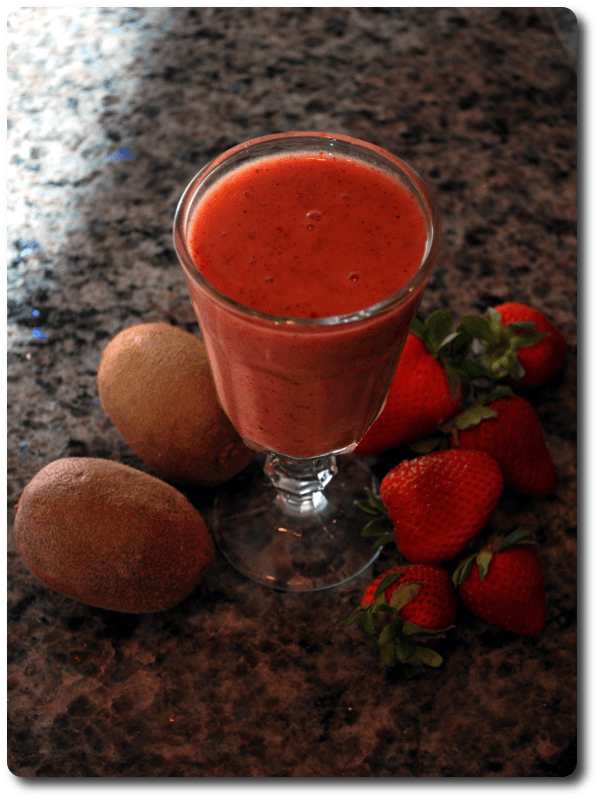 Sweet, sour, and nutritious, this kiwi strawberry smoothie will get your attention with deliciousness. Wash the fruit. Peel the kiwi as desired (though the skin of a kiwi fruit is edible and packed with fiber and vitamin C, not everyone loves it). Hull the strawberries. Add liquid to the blender, then layer kiwis and strawberries. Top with (optional) ice. Blend to your desired consistency. We've tried this recipe with and without orange juice. A third of a cup is about as much as you want, lest the flavor overwhelm that of the kiwi. Obviously you can use the same amount of water to let the other flavors express themselves. If you don't have fresh strawberries, substitute frozen strawberries as necessary. Add water, but skip the ice cubes. As an optional addition, try half a cup of Greek yogurt. Our preference is vanilla, but plain would work well in this case; the flavor of the kiwi can easily get lost unless you're very careful.